Kittinger cabinets (pair), lacquer, from the Kittinger "Mandarin" collection, one drawer above open storage with one adjustable shelf, each signed with metal Kittinger / Buffalo NY tag. 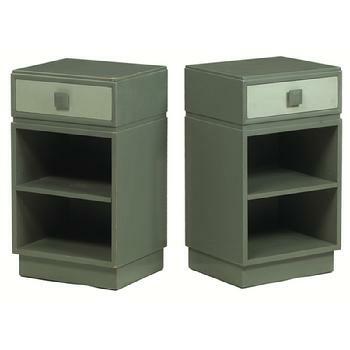 Structurally, these cabinets are in excellent condition. Excellent Kittinger level craftsmanship, sturdy and solid. These cabinets retain their original finish, which could be touched up. Cabinets could also be fully repainted. Pair includes touch up and light restoration to original finish, retaining original color as shown. For complete new lacquer in your choice of color, please contact gallery.